Rule number one when coming up with a band name: make sure no one else has it. You want to stand out at least a little, not get slapped with a cease and desist or lawsuit. You want to hopefully have your MySpace page show up on search engines, etc. 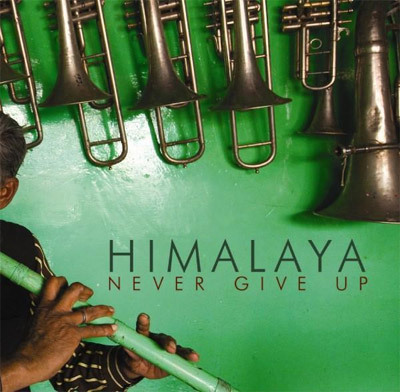 But go and search for Himalaya on Google, and nowhere will you find the MySpace link for the artist in question (you will find a million other “progressive,” “psychedelic,” “indie” bands with the exact same name). That is precisely the problem with Never Give Up; there are a million other post-rock records that sound very, very similar to it. Nowhere does it stick out or make an impression of any kind. While this record is a noble attempt at creating the vast, ethereal texture one might want out of a record of this ilk, it simply does not grip the listener and give them anything tangible to hold onto. “Hearts Are Not Made of Glass” opens the record, centered around a painfully slow-moving piano part that weaves its way through with the help of very sparse percussion, and eventually other sonic layering, and the next 20 or so minutes of the record move at a similar pace. Not until about halfway in does the record start to pick up, and by that time, you will most likely be asleep. Perhaps I judge too harshly due to a penchant for rhythm, but it was nearly impossible to wade through the entire forty seven minutes of the record’s duration. If you do Google this band name and album title together, the second result is a Tweet saying, “Good listening while reading and writing my #masterthesis.” I agree with said Twitterer; this is a record that will serve you best as background music while you do something that deserves the majority of your attention.